It's an exciting day at the Wildlife World Zoo – time for veterinary checkups, starting with the goofiest tiger you'll ever see! ABC15 was exclusively invited to sit in on the appointment. Meet Orion, a five-year-old male Bengal tiger who loves to play. He galloped soaking wet out of his pond to greet his trainers when it was time for the checkup. Watch the video above to see what happens at a tiger's doctor appointment! 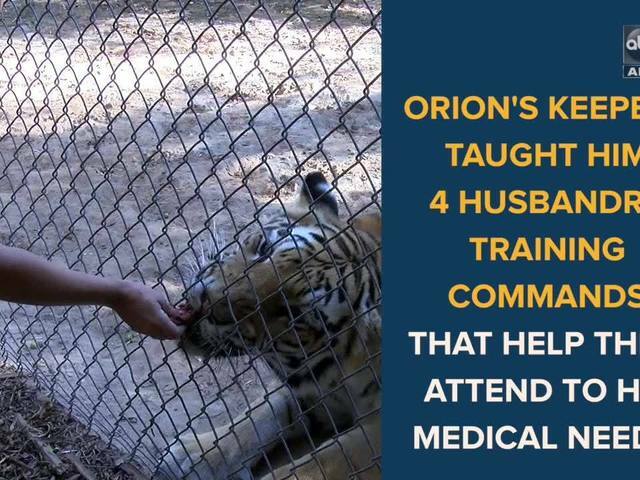 Orion was hand-raised by his trainers in Litchfield Park. His keepers taught him four husbandry commands that help them attend to his medical needs. Husbandry commands are signals used in the medical field to help humans aid animals. They are strictly used as a human advantage to help take care of the animals; not for entertainment purposes. Orion knows DOWN, SIT, PAWS and FOCUS. These help with positioning in case his trainers need to give him medicine. His trainers administered two injections: one subcutaneous, the other intramuscular. The "lean-ins" help trainers when they need to give him vaccinations. 3ccs of blood were drawn after, which is enough to do two in-house tests. The trainers will examine Orion's white blood cell count, red blood cell count and liver enzymes to make sure he doesn't have valley fever (test once a year) or diabetes. Orion eats a little over 10 lbs/day. During winter the amount increases to about 15 lbs/day. His diet consists of horse meat, rib bones, knuckle bones, fish and chicken. The spirited tiger is about 350 lbs. but gets up to 400 lbs. during the winter. He likes melons and pumpkins but tends to play with them more than snack on them. When he's not being goofy with his enrichment toys (boomer balls) or splashing in his pond, you can find him joking around with his mom, Kipling.